DOLORES (Device Optimized for the LOw RESolution), LRS in short, is a low resolution spectrograph and camara permanently installed at the Nasmyth B focus of the Telescopio Nazionale Galileo. Its design allows to perform imaging and low resolution spectoscopy observations. 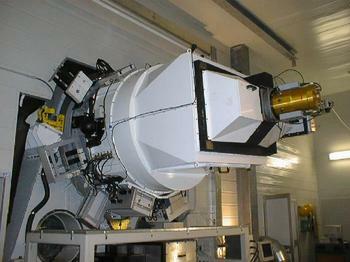 The instrument is based on a collimator and on a focal reducer and camara. To select the observing mode GRISMS, for the low resolution spectroscopy, or optical filters, for multiband photometry can be inserted into the optical path soon after the collimator. Slits are carried by a slider, Tram , located at the telescope focal plane. The Tram can carry up to 5 long slits or Multi Object Spectroscopy ( MOS ) plates. Thanks to its design switching from imaging to spectroscopy takes a short time ( about 2 minutes in the worst case ). The camera is equipped with a 2048 x 2048 E2V 4240 Thinned back-illuminated, deep-depleted, Astro-BB coated CCD with a pixel size of 13.5 µ. The Field of view is 8.6 x 8.6 arcmin with a 0.252 arcsec/pix scale. Figure 1. Picture of DOLORES mounted on the Nasmyth B focus. A calibration mirror for wavelength calibration with Thorium and Argon lamps. An off-board set of lamps (Helium, Neon and Halogen) for wavelength and Flat Field calibrations. A flat mirror which feeds the high resolution spectrograph SARG. The Tram which can carries 5 fixed width Long Slit Units (0.7", 1.0", 1.5", 2.0" and 5.0") or up to 5 MOS plates. The Filter Wheel. Normally eleven imaging filters are mounted on the wheel. ( please take a look at the TNG filters page for a list of available filters ). The Grism Wheel carries the dispersing optical elements ( grisms )and the focusing-pyramid device. 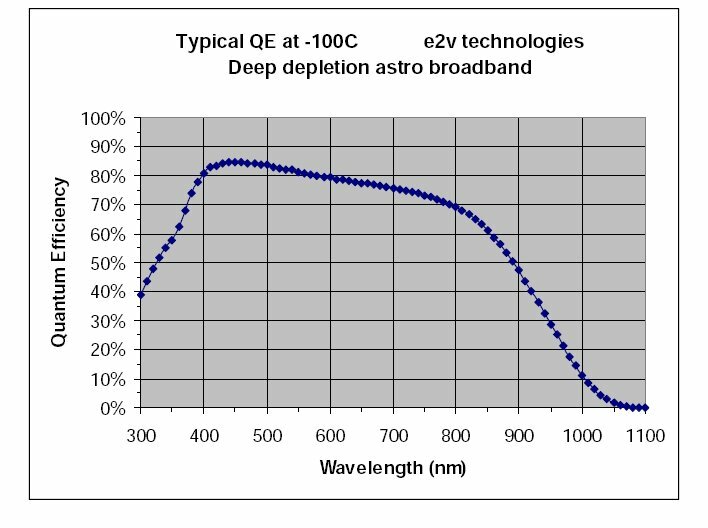 The CCD mounted since Januarry 2008 is an E2V technologies CCD42-40 Astro Broadband, Deep Depleted. QE peaks at 95.8% around 600 nm and is 52.7% at 900 nm ( see Figure 2 and Table 1 ). The CCD conversion factor is 0.97 e-/ADU and the typical readout noise is slightly below 9 e- r.m.s. The linearity is better than 1% over the whole dinamical range. Dark current is unappreciable even on long exposures and saturation occurs at ~65500 ADU. The full-frame readout time is 25 sec with binning 1x1 (default). Smaller windows and higher binning can be easily set to reduce the CCD read-out (see our CCD's Read-Out Time Calculator). Consider that, anyway, time between two consecutive images will not be less than the time taken to save the image on the hard disc plus the time taken to check the instrument setup. Figure 2. The typical E2V CCD Quantum Efficiency. Table 1 reports the measured QE specified in the CCD data sheet. Normally, 11 imaging Filters are permanently mounted on the Filters Wheel. Table 2 sums up instrumental Jhonson-Cousins zero points. The 'i' subscription stands for 'i'nstrumental, exposure time normalized and 0 airmass extrapolated magnitudes. Table 2. Measured Jhonson filters zero points. Exposure times for the broad band UBVRI and u'g'r'i'z' filters can be obtained with our Imaging Exposure Calculator. The La Palma extinctions coefficients and the Night Sky Brightness at various lunar phases are given here. Figure3. In red the spectrum of the standard star Feige110 taken with the old LORAL CCD and the LR-R GRISM. In blue the same star taken with the E2v4240 CCD currently mounted and the same instrumental configuration. The significativelly lower fringing of the new CCD is evident. LRS has a custom-made double-blade shutter which allows exposure times as low as 0.02s with uniform illumination of the Field. The LRS grisms wheel at present carries 9 Grisms and the focusing pyramid. At present 7 of the 9 installed grisms are Volume Phase Holographic grisms, resulting in a substantial improvement of the spectroscopic capabilities of the instrument. The characteristics of the Dolores grisms are given in Table 1 (older table is available on this link). The Exposure Times for the different grisms can be calculated using our Spectroscopy Exposure Calculator. Table 1. Grisms and wavelength calibration lamps available for DOLORES. The LR-R Grism has a built-in order-blocking filter cutting blueward ~5000 Å; nevertheless, blue objects will show noticeable second-order overlap above ~9500 Å (see Plot). This Grism is not mounted on the grism wheel and may be used ONLY in visitor mode. Users interested in using this grism must explicitely request for it in the Observing Proposal. This Grisms suffer of significant second-order effect and will be automatically coupled with the ~560 nm cut-on filter available on the filters wheel. Resolution calculated for a 1" Slit. Please Note that there aren't, at the moment, suitable wavelength calibration lamps for this GRISM. Figure4. 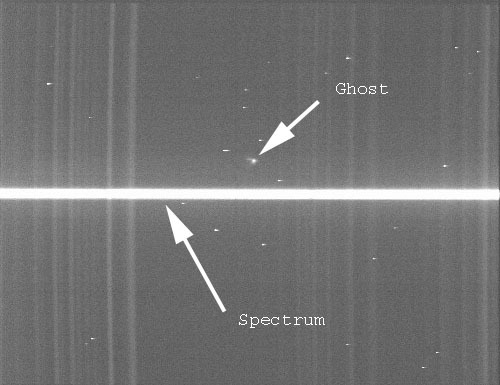 The typical ghost which affects almost all the VPH grisms; spectrum taken with V656 is shown. A MOS mask consists of a number of vertical (along Y) slits of the same width (either 1.1" or 1.6") and different lengths. The slit width is set by the drilling tool used (0.2 or 0.3 mm) and must be clearly specified when the MOS files are submitted. Slits can be positioned anywhere within a rectangular area of X=6' by Y=7.7' (sky projected angles) around the mask center. If you are planning to observe with one of the V390, V589 or V656 GRISM please read the note under the GRISMS description section. The relative positions of the slits (positive toward E and N for position angle=0) must be defined and submitted (see below) by the user trying to maximize the number (typically 15-25) of objects and avoiding any overlap of the slits in the Y direction. To this purpose, any position angle can be adopted when designing the masks. The value of position angle of each mask must be comunicated to the contact astronomer. It will be of fundamental importance during observations even if is not needed during the manufacturing phase. To simplify the observing procedures we recommend including in the mask two pinholes (i.e. slits of zero length) centered on relatively bright (V ~13-15), easily identifiable stars within the field of view. Also, consider the possibility to put in your mask three slitlets (toward the EAST border, center and toward the WEST border) in order to get clean sky spectra with the widest possible wavelenght range. This could be useful to better subtract the sky from your targets spectra. The relative positions of the slits can be determined from any undistorted image with precisely known scale, ideally with an accuracy better than 0.1%. Images from DOLORES (with any filter) can be used for this purpose, the scale is 0.252 arcsec/pix and with totally negligible distortion. DOLORES images taken at position angle=0 have a standard N-up E-left orientation. The resulting slit positions should be arranged into a text file as in this example . The files (one per mask) must be then sent to the contact astronomer in due time (see below). As an alternative, you may prepare the masks using IMDI, an IDL interactive program developed and maintained by Enrico Held (INAF-Padova Observatory) which requires DOLORES (pre)images. The files produced by this program should be also sent to the contact astronomer. Each program can request up to a maximum of 5 MASKS per night and 10 MASKS per observing run. To make sure that the masks are prepared in time, the observer must submit the above mentioned files at least 4 WEEKS before his/her observing run. Observers requiring pre-imaging must provide all the information for the pre-imaging at least 2 MONTHS in advance of the scheduled nights for MOS. The pre-imaging will be executed as soon as possible in service mode and the time used will be counted as a part of the total time allocated to the proposal. Please note that, in case of long periods of bad weather, the TNG cannot guarantee that the pre-imaging observations will be executed. 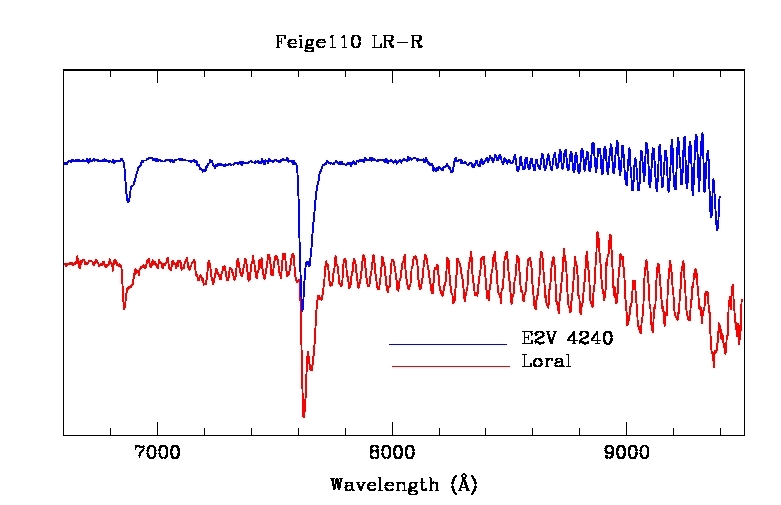 A set of Spectrophotometric stars, extracted from the IRAF database and well suited for calibration even with the reddest LRS Grisms is given in Table 3. Finding charts are 10'x10' cut-outs from DSS2 Red (North Up, EAST RIGHT!, just like LRS field orientation). Table 3. Spectrophotometric stars selected from the IRAF database.